The Super Bowl is tonight but with it comes a lot of extras like commercials. 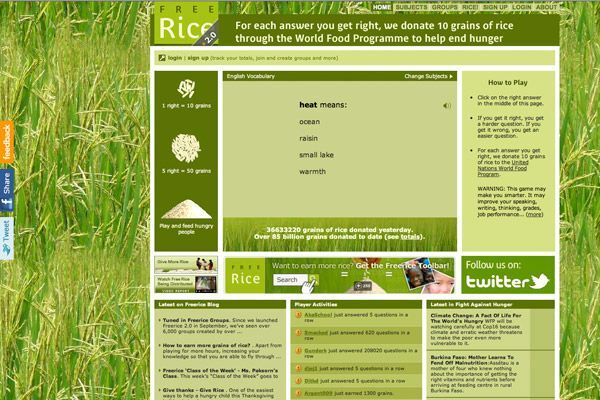 Instead of watching these million dollar ads, you could take those few minutes and feed the hungry at Freerice.com. FreeRice is an award-winning game where you answer questions in vocabulary, math, science, literature, art and other subjects. For each correct answer ten grains of rice are donated to the UN World Food Programme, the largest agency fighting hunger. The rice is paid for by advertisers on the site. FreeRice donations are currently going to Niger, to help feed schoolchildren in the drought- stricken country. Niger is also host to thousands of refugees from the war in Mali. If everyone took a few minutes during commercials to play, lots of rice could be raised to feed the hungry. It can be a FreeRice Super Bowl.